Wherever he goes, Buddhist monk Matthieu Ricard is asked to explain what meditation is, how it is done and what it can achieve. in this elegant, authoritative and entirely accessible book, he sets out to answer these questions. Although meditation is a life-long process even for the wisest, The Art of Meditation demonstrates that by practicing it on a daily basis we can change our understanding of ourselves and the world around us. 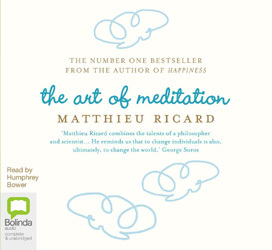 In this brilliantly inspiring book, Matthieu Ricard talks us through the theory, spirituality and practical aspects of meditation. he illustrates each stage of his teaching with examples and pictures, leading each reader deeper into their own practice. Through his experience as a monk, his close reading of sacred texts and his deep knowledge of the Buddhist masters, Matthieu Ricard demonstrates the significant benefits that meditation, based on selfless love and compassion, can bring to each of us.